I am interested in learning to do the shashiko quilting. I would love to hear from those who do this stitching: How hard is it to do? Can a person with arthritis do it? I cannot hand quilt due to my fingers not working well but I thought I might be able to do this. How do you trace a pattern? What supplies do you need? Thanks in advance for all the info you might offer me. I love this board! a friend in Japan sent me a kit to use but I've not done so yet. and I bought two from shiboridragon site. tea cosy and such. very nice. I like blue fabric with white stitches. my friend sent me white fabic with blue thread. different. sashiko I the correct word I think. Do you have to use the blue and white? Anyone who has done this, also wondering if it would be easier that handqulting due to the size of the stitches. I love the handwork but can't do small stuff anymore. Thanks again! The title should have said sashiko "is" the correct word. not awake good yet! I watched the videos. My question is do you make the tops and then quilt? Or do you make a sandwich and then do the sashiko stitching? I guess I'm asking the same question as Helen6869. the lady in the second video said the needle is longer, stronger and more rigid than other needles. Well, I bought a book on sashiko but haven't tried it yet. There is a quilt shop a ways from me that features sashiko and the owner there told me a lot about it when I was there. I'll pass along what she told me. I haven't read much about it on line so this is just what the shop owner said. The fabric used is a little heavier than quilting fabric but I think you could use 2 layers and that would work for a practice piece. The fabric reminds me of homespun. The thread she had was more like crewel yarn..... a heavy, thick yarn that will really show up when stitched. She said that using 3-4 strands of embroidery floss would be similar. The stitches are just running stitches but they are supposed to look like grains of rice laying in a row so the stitches on the top side of your work are longer (about the size of a grain of rice) and the spaces between them are short. Using a long needle allows more stitches to be loaded but I really think any needle would work. At least try any needle before going out and buying something special. So, you could practice on a small piece and see how your hands feel without going out and paying lots of $ for a kit, etc. I bought some of the fabric because I really liked the density of it and I'm going to try it at some point..... when I get some of the things done that I've been working on.... you know how that goes. I watched the video- it looks like only one layer of fabric. Sure did look pretty on the examples that were shown. I thought when I opened the thread - that it was going to be about the machine with the similar name. I have done sashiko in the past. Much easier to do than quilting. It is done in a single layer of the sashiko fabric with sashiko thread, no hoop. The blocks are made individually and then joined together to form the top. I used a regular sewing needle, the longest in the pack of generic needles. My patterns have appliqued flowers on them also. I remember marking the material myself, but it's been so long ago, I don't remember how I did it. My sashiko projects are all UFO's!! If I remember, I'll dig them out and see if there is anything else I can remember, and post it. I really enjoyed doing it, but due to a new job, got away from it. Thought when I retired, I would start again, but have been retired three years and forgot all about it till I saw this post! LOL! I have done sashiko - am doing some now. I have a novel approach to getting the design onto the front of the fabric. I copy what ever pattern I like onto freezer paper via the copier and iron the freezer paper onto the front of the fabric and then using my DSM stitch on the lines thru the freezer paper. Rip off the paper and sew the sashiko stitch right next to the the sewn lines - when done I rip out the DSM sewn lines. More work but not too much and you don't have to worry about the marking lines not washing out. Sashiko fabric is thicker or more dense cotton and I have found that the marking pens are hard to get out without leaving a residue. This method you can use any design you want and you don't have to be able to draw. I've done Sashiko in the past and you'll have to see if your arthritis can tolerate it. I would think any time of hand sewing would cause problems depending on how severe it is. I have also done a little hand sashiko.... somewhere I have a UFO.... if I kept it.... I don't think it would be any easier to do than any other hand stitching. Yes your stitches are larger but so is your thread to pull through the fabric. I haven't tried it, but I get the sense that it's more along the lines of embroidery than quilting. Have you checked your local library for books on sashiko? I was looking for a hand sewn look that would be easier on my hands that hand quilting but after watching these videos etc. I think Sashiko is still quite difficult to sew and have it look like it should. I do like the look of the Baby Lock Sashiko machine though. That might be the way to go. Not hand sewing but the same look. Thanks for all who took time to answer and offer me some info about this. It is a truly beautiful way to decorate a piece of fabric. Thanks! Made some beverage coasters in the blue with various colored threads. It is precise and very deliberate stitching that one follows a grid or pattern. I bought a book on sashiko in San Francisco and love the look of it. It's probably harder on the eyes than the hands, anyway for me that is so. It is derived from Japanese women mending or reinforcing everyday type work clothes in blues, Therefore the blues. Now, it is celebrated as an art form with meaningful Japanese symbols. Sorry, but sashiko is hand quilting. It is all straight lines, with each stitch the same size in lenght(sic) and separation and the use of contrasting thread. When I first learned to do sashiko, tiger tape came in very handy. 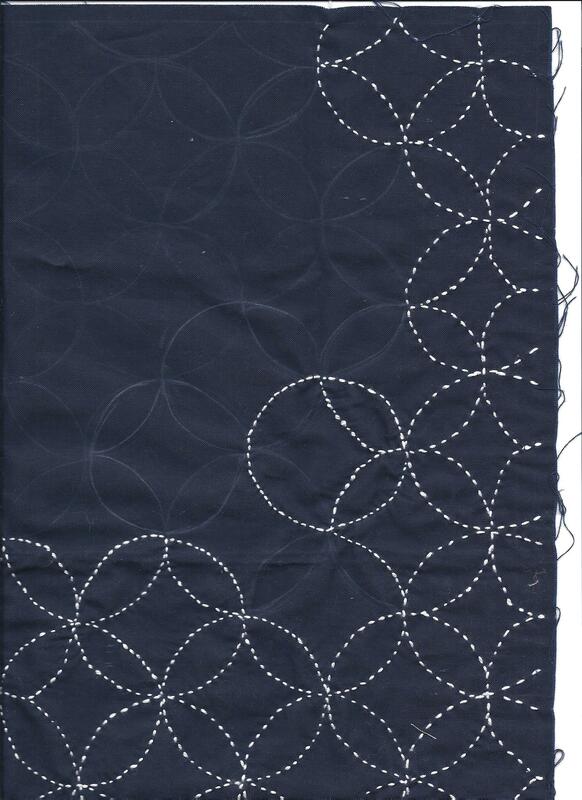 You can use sashiko to do all over quilting or just do sections, like a grid. Nowadays, I have heard, there are sewing machines that do sashiko. I do not remember the manufacturer. Sashiko is all about the stitch. Your favorite size of quilting needle will do. I use topricin on my hands and wrists when doing any kind of hand work. No smell or oily stain. Traditionally, this technique was in stitched in white thread (you can use pearl cotton) on a denser blue fabric that was hand dyed using varying shades of blue indigo. Now the thread comes in a variety of colors and fabric is available is colors also. If you can, look online at traditional fabric to understand the weight/density of the fabric. Don't use traditional cotton quilt fabrics as the weight is too light and the weave too dense. An embroidery needle is used because of the size of the thread. It's easy to do. You can take a piece of transfer paper, place it transfer side to the right side of the fabric and trace the straight lines using a ruler as guide and a stylus to run over the lines instead of a pen. Please don't use the marking pens. When washed, the lines can come back permanently when the fabric is pressed. It's fun and even with arthritis, you should be able to do it, as little pressure is required. I have done sashiko. It is more like embrodary than quilting. Design is done on single layer of fabric then sandwiched and quilted. Sorry, but sashiko is hand quilting. No, it is not, because it's traditionally done on a single layer of fabric, not on a fabric sandwich. Regular quilting betweens will not work, because the eye of the needle is too small for the thread. Helen, as to whether you can do Sashiko with arthritis in your hands, the only way you can really find out is by giving it a try. It is quite similar to the movements needed in hand quilting, but you don't have to push through all those layers. I bought the book Japanese Sashiko Inspirations by Susan Briscoe and highly recommend it. Her projects are great and show many other colors used effectively. I have done some, and you will have to try a sample to see. Indigo and white is traditional, but if you want a different colour, why not? I've also done it on the machine as a' quilt as you go'... Use invisible thread on top and a heavier bobbin, working from the back and through a paper pattern. I've seen beautiful sashiko in red and black - you can do what you want if it is your project. There are special sashiko thimbles that you should use. They make the work much easier. You can get traceable patterns and transfers if you find drawing the designs difficult. All the best with it. Thank you for the sites. They are very helpful! 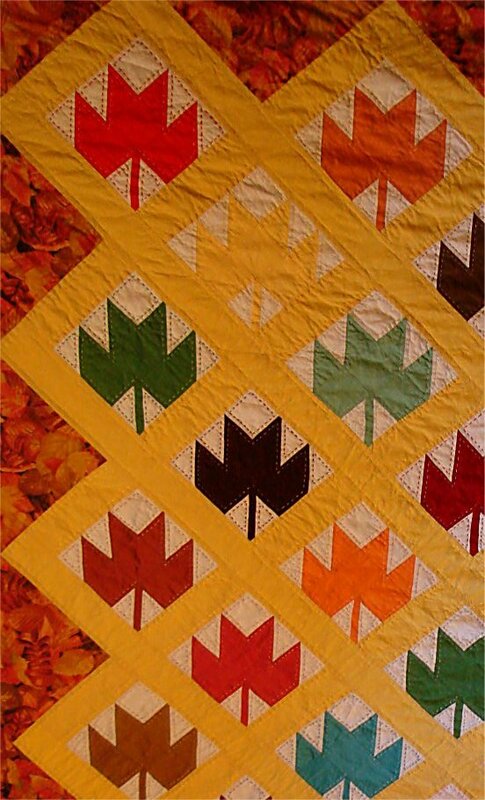 My husband's Grandma died 6 mos after we were married, and I inherited her quilts, in various stages of being sewn. 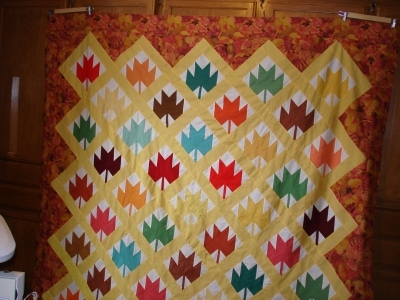 There were a bunch of hand quilted maple leaf blocks, with a graph chart she drew of how she was planing on putting them together. We've been married 31 years, but I only tackled this quilt a year ago, mostly because I am NOT a hand quilter, and like I said, these were all pieced together by hand. To me, they deserved to be handquilted. I guess it took this many years for me to discover what I called 'Big Stitch' quilting. I just outlined each leaf shape, and used various fall colors. I purchased a piece of navy blue poly/cotton fabric, used white Perle #5 DMC cotton thread, drew a pattern using the base of a small wine glass, making certain the outside edges touched on four side of the previous drawn base of the glass - keeping it in a straight line, and that is how I started this 15" square. Once I am finished it, I will make a circle around the square making a case to hold a ribbon as a draw string with the ribbon being pulled tog. on the outside of this bag, and will line it with another patterned fabric, and will give away for Xmas. I find that its' a great way to practice learning something new. Here is a picture of the one I'm just learning to do - this is my first attempt.